Using an email service provider such as Mailchimp or Campaign Monitor is the only way to do your email marketing properly. A useful feature is the ability to prepare your e-shots in advance and schedule them to send on a particular day. This can be useful if you’re going to be out of the office on the day of send, or if you want to optimise your workflow by preparing content in advance. However, there is one potential downside to pre-scheduling. By the time your content is sent, it could have become be embarrassing, or at worst insensitive. Spring has finally sprung! It’s time to head outside and make the most of the warmer weather. It’s complemented by a nice picture of a car driving past a spring meadow! The only problem is it was sent on Friday 22nd March 2013, a weekend which saw snow and freezing temperatures across the UK. My guess is it was prepared some time in advance and pre-scheduled. The red highlighting is mine, for emphasis. 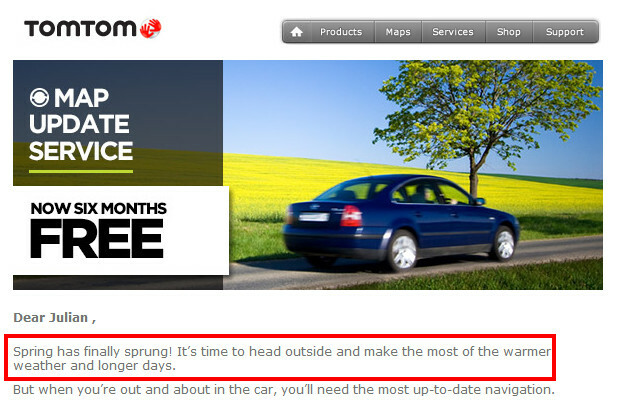 Now, I’m a fan of TomTom’s email marketing, and I’m sure this weather faux pas won’t have done their reputation too much harm! If you are going to pre-schedule your e-shots, check whether there is any content which could potentially cause a problem for you. If so, then it’s worth making a diary note to double check the day before the scheduled send. Weather related content, like the TomTom example above. Topical content. For example, something relating to the economy where the situation might have changed by the time the email goes out. Natural disasters or political unrest. For example, a travel company promoting a destination where an earthquake or an uprising has just taken place. 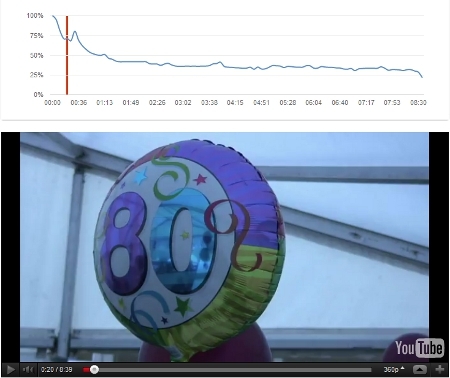 YouTube has recently introduced a massive improvement to their video analytics. This brings some powerful benefits if your business has videos on YouTube. You can now monitor how long people watched your videos for. It’s all very well saying your video got 800 views but what if those viewers stopped watching part way through thus missing out on your key message? Now you can play the video and view a graph showing exactly which proportion of the audience were watching at any given time. See the example below. Go to www.youtube.com/analytics and logon to your account. Click “audience retention” on the left hand side bar. Then choose your video beneath where it says “content”. Play the video and the red vertical bar will move. Note: This will only work for videos with more than a few hundred views. Analyse where the drop off occurred. What specific content caused people to tune out? Was your video too long? 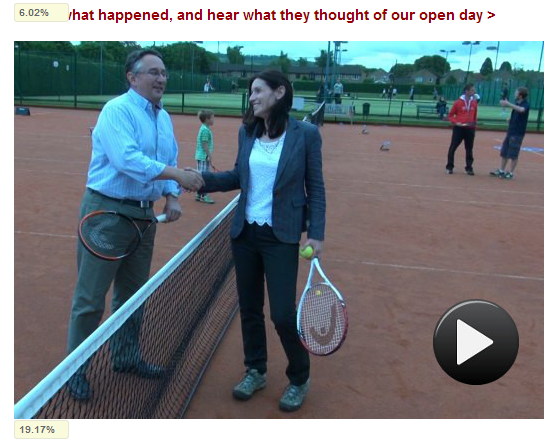 Could you have got your key messages across in a shorter video? 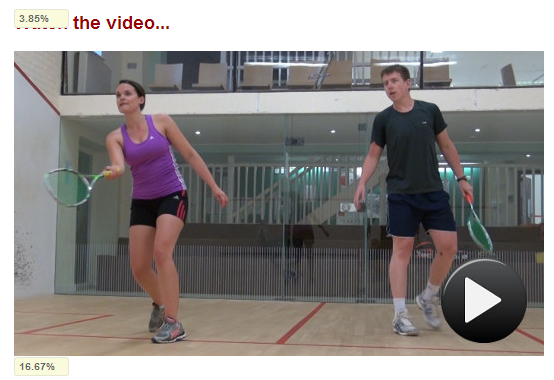 Use the results to work out what you could do differently next time you produce a video. Here is an example of the audience retention measure. As you play the video in your YouTube account the vertical bar moves across. If you’re a business owner talking on video you only get one chance to make an impression. If you’ve put that video on your website it has potential to reach tens of thousands of viewers. However even the most confident of people can become unnerved at the sight of a video camera. Unfortunately this can mean people come across as a bit ‘wooden’ or even lack authenticity. Instead of the business owner talking to camera try this. Film the subject in two way interview style rather than direct to camera. This will ensure the speaker comes across much more naturally and authentically. Interview style is where the subject is looking slightly to one side as if talking to an interviewer. Treat it as a conversation and ask them some questions. Pause between questions if it helps to calm them, and if they stumble over their words give them time and space to re-do it. Then edit out the questions and splice the answers together to make a really tight, watchable piece. 1. If you’re self-shooting, that is without a presenter/reporter, make sure you position yourself behind the camera so the interviewee has someone to look at. 2. Make sure the eyeline is correct. There’s a useful tutorial on this on the BBC College of Journalism website. 3. Re-frame in between questions with a selection of tight and wide shots. This will avoid jump cuts when you edit our your questions. Another option to avoid jump cuts is to use cutaway shots to cover up the edit points. Watch this example featuring Nicholas Granger of British Bespoke Auctions. As an auctioneer Nicholas is no stranger to public speaking, but by shooting it in interview style he comes across more naturally and is more animated. Also note how two cutaway shots are used to cover up edit points! Can you transform amateur video into something which looks professional? Yes you can. It is possible to transform amateur footage into something fairly watchable, but it depends on the quality of the original footage. The tv news channels do it often with user generated content (UGC). What they do of course is edit the footage provided by the viewer into a brief 20 second clip. Of course it’s never going to be as good as if their own news crew had been there. As professional video producers we’d normally prefer to be there ourselves and edit our own footage. We’ve produced numerous videos for our client The Stuart Holmes Hair & Beauty Spa however when they attended the Hairdressers Journal Awards (HJA) it was not practicable for us to be on hand to capture Stuart’s moment as he accepted the award for Salon of the Year. Not least because HJA had their own film crew in attendance. The workround was Stuart took his own video camera and a team member shot the video as the awards were announced. Stuart then passed the footage to us to see if we could transform it into something watchable! So, when it’s not possible to have the video professionally shot and you need to use amateur footage here are some tips to enable a professional editor / producer to transform it for you. – This will enable the editor to choose the best bits. – Don’t be tempted to “self edit” by stopping and starting. If in doubt leave the camera rolling. – If it has an image stabilisation function switch it on. 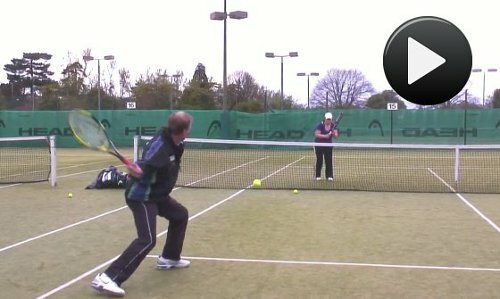 – Resist the urge to pan from side to side or up and down. – If sitting at a table rest your elbows on the table to steady the camera. – Consider investing in a basic tripod. Or you could try a mini tripod. Search Amazon or E-Bay. You don’t need to spend a fortune. – This is called “tromboning” and will make it diffcult for the pro editor to edit your footage. – Use the zoom but do so to frame the shot and remember any camera shake is magnified the more you zoom in. – Some domestic camcorders may have a function to manually adjust the exposure settings. Don’t overdo it though or the picture could become over exposed. –– The internal mics on domestic camcorders are not that great so by using an external mic you’ll improve the quality of speech recording. – Note: For the above video the camera’s internal mic was the best option as it picked up ambient sound from the venue’s PA system. 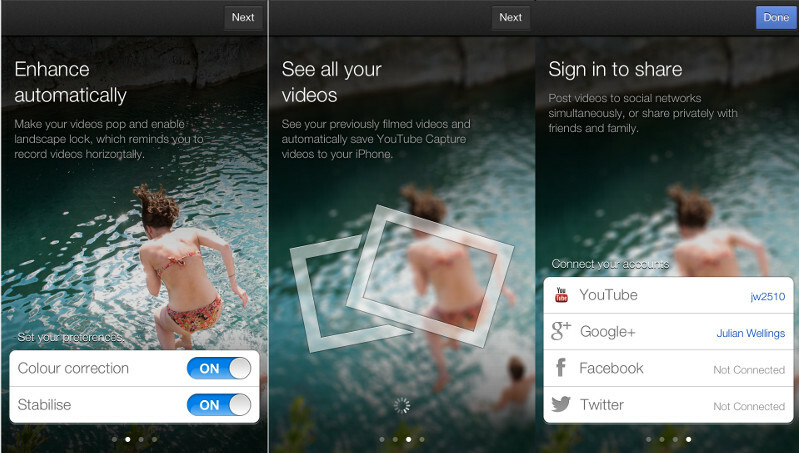 YouTube has just launched a new free app for iPhone and iPod touch. The app complements the existing YouTube iPhone app by simplifying the upload process and enabling easy social sharing to Twitter, Facebook and Google Plus. There are also features to enhance videos with colour correction and image stabilising. You can even add music from a pre-determined list of tracks and there’s some basic editing functionality with a trim function. YouTube Capture is ready to record as soon as you open it. This is quicker than using the built in iPhone camera app where you have to switch between stills or videos. Videos recorded on YouTube Capture are saved to the camera roll. When you’ve finished filming filming, write a caption, select which networks you want to share to, and hit Share. Even if you minimize the app, the video will keep uploading in the background. You can control who sees your video by setting it to private, unlisted (only people with a link to the video can view it), or public. Another feature I really like is that YouTube Capture will remind you to rotate your phone to a horizontal position for filming. This avoids ghastly vertical videos being uploaded to YouTube! YouTube Capture is available in the Apple App Store and there’s more information here. YouTube say they’re working on an Android version.